Who really belongs to Brad Pitt? I have made a Brad & Jennifer spot, will anda join? What is your favourite Brad Pitt movie? how abt posting a nice colourful pic of brad??? What's his taste in music? why do u cinta brad pitt? N/a'an ku sê and the Shiloh Jolie-Pitt Foundation have committed to a new long term partnership together. Angelina Jolie and Brad Pitt have donated US$2 million towards the N/a’an ku sê mission, which aims to conserve the land, cultures and wildlife of Namibia and to rescue species threatened oleh an ever-shrinking habitat. It also strives to improve the lives of the San Bushman through better education, employment, healthcare and living conditions. Once Upon A Time In Hollywood is set to be released in July 2019 and Celebrity WotNot can bring anda some behind-the-scenes footage of the highly anticipated movie! Which Brad Pitt movie is this scene from? 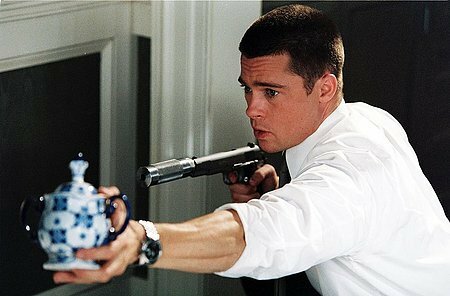 Post a Pic of the Movie of Bradd Pitt which u hate the Most.........!!!!!!! !